Clean fallen leaves out of succulents like yucca plants now, while it's easy! At this time of the year in Western Oregon, gardening projects are best broken down into sunbreak-sized chunks, since sometimes all we have is 20 minutes before the next deluge. Here are a some ideas for quick garden projects that you can get done quickly, maybe even without donning a raincoat! Pull out those summer veggie plants. Blackened tomato vines and mushy squash plants can go - especially since they can host fungal disease from year to year. Most other old vegetable stalks can be left as forage/habitat for birds, at least for the next month or two - birds can pick off any remaining fruit or seeds or insects. Rake leaves off lawn. We love to hate our lawns for their water-wasting ways and, well, for being boring. 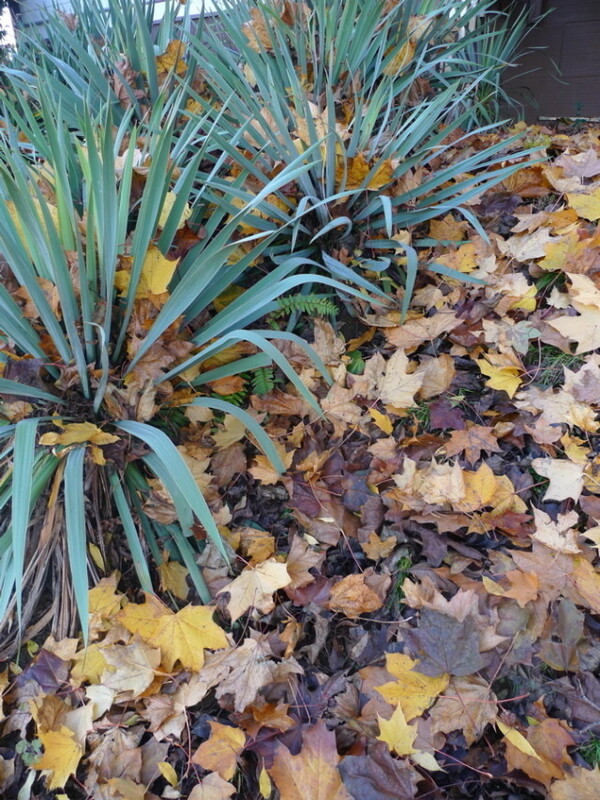 But don't smother lawn under a blanket of neglected leaves - this just encourages weeds to replace the grass. Better to stare at the lawn for a while this winter and contemplate what kind of garden you'd like to replace it with. Meantime, rake about once a week until those leaves stop dropping. If you care about your lawn, it's all the more important to keep it clear of leaves in the fall. If you get a dry day, chop leaves with a lawnmower and spread them over your vegetable garden. Add them to your compost pile to break down into glorious compost over the winter. Or just toss them in your yard debris bin. Most leaves are good for home compost piles - just avoid black walnut, which contain a growth-suppressing substance called juglans (give black walnut leaves a year or two to decompose before adding to your garden) and avoid composting too many big, waxy leaves like English or Portuguese laurel, which take forever to break down in ordinary garden conditions. Bring houseplants inside. If you haven't brought them indoors yet, do so now. It has been unusually warm this fall, so most frost-tender plants (Aloe vera, rubber trees, tender orchids like Paphiopedilums, etc) won't mind too much unless you live at higher elevation in the Portland area. And many plants, like Cymbidium orchids and Thanksgiving cactus, actually need some cool nights to set flowers. But this warm weather won't last much longer. Also, bring inside half-hardy succulents like Aeonium and Agave. If a winter freeze doesn't do them in, the constant rain will. Once the night temperatures shift from cool to cold, you'll want all those plants tucked in, indoors. Before bringing them inside, wipe off the outside of the pots, check the underside of the pots for slugs and wipe off the leaves to remove insects like aphids. If the plants are lanky, give them a trim. For more late fall gardening tips, click over to Portland Monthly's monthly gardening column.